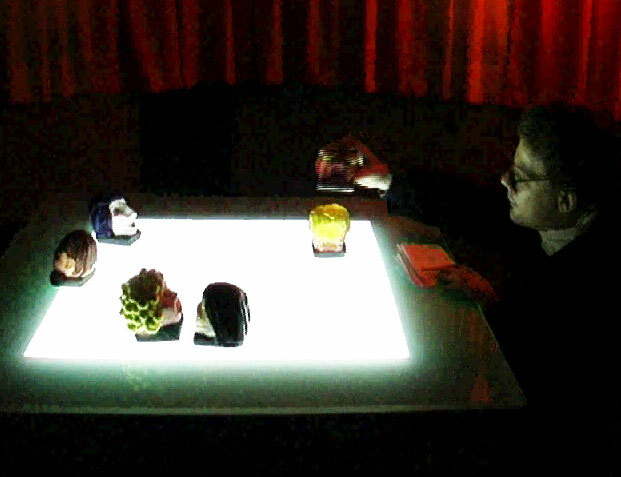 Heartbreak Hotel is an interactive, immersive, sound spatialized environment, in which the user/gamer plays with figurines on a physical "table" interface. The environment used to present the work is a sound deadened chamber in the form of a giant heart. The public enters the heart. In the center is a transparent table surrounded by eight invisible loud speakers. The public is able to place figurines representing six different characters on a table and move them around. The respective gender of the characters (An individual in an all male group has a different data-base selection versus the same individual in a mixed couple for instance). The distance between the characters. The subject and/or mood of the preceding text. Several groups can be formed at the same time if they are separated in the space, if three groups are formed at the same time the result can become quite cacophonic. Heart-break Hotel can be played with alone or with up to six people. The theme of Heartbreak Hotel is of course lost love. The characters are generic types; a male yuppie (dot.comer), a dumb blond, a female rock and roll goth, a cowboy/survivalist, a male poet and a nun. So much of modern society and an individuals identity is filtered through media images that often a person shapes their identity to fit the flattened icons of media. Heartbreak points out this flattening. In a process of removing the author Peter and I sought to utilize computer programs to generate text . In this way we could write dictionaries of words and expressions specific to each character, input these into the programs and generate the script. Peter often remarks that much of what we do is prepare the machines to be creative. We agree however that the opposite direction of self obsessed artistic invention seems a lackluster alternative. The GMEM (Centre nationale de creation musicale Marseille, France), the GMEM are not only co-producing this project financially but also helping in terms of programming and development. The Data base system "Gnoum" was written in LISP by Laurent Pottier, working in collaboration with Peter Sinclair during a residency which took place in June this year. Laurent has also helped by adapting the Holospat to this project. GMEM will present the piece in Marseille, France Jan 01. The CICV Pierre Schaeffer; Invited G.H. Hovagimyan and Peter Sinclair to do a one month residency (August/September) during which they were able to concentrate on experimentation with different methods of text generation. STEIM, Invited Peter Sinclair on a residency at there studios in Amsterdam. This residency was used to develop the Bigeye interface with expert guidance from Frank Balde (in house developer). At the time of writing we are about to embark on the construction of the physical environment which houses this piece, the complex question of sound-proofing, coupled with transportability, as well as the aesthetics of the structure have been worked out with the help of Architect Tilman Reichert, and the marseille based company specializing in acoustics Iso-inso.